This is Michelle, Craig and Brian (left to right) when we were out for supper just before Michelle's return to Winnipeg. We've had a great holiday season with family. Both my sister and brother (and families) were in Regina this year, and it has been great. Also wonderful to have our little "Schweitzer" family under one roof again. I continue to feel about the same - which means fine most of the time. I still have to rest and sleep a lot, but otherwise, I feel that I am doing quite well. Although the last scan still shows disease present, the fact that I am feeling OK is a pretty good sign for at least a bit of stability. Still, I expect the "chemo break" to come to an end in the next little while. Upcoming Medical Issues: Jan 5 (routine visit, port care, etc...) in Winnipeg. Jan 19 - I meet my Saskatchewan oncologist at the Alan Blair Cancer Clinic..... Repeat CT scan: late January (not yet booked). Cheer to all........... Happy 2007. Great shot of the kids. Glad you're still feel relatively good. Hope you take all the rest you can, the more you "put in the bank" the better I guess. Wish you good luck with the scan, and hoping the new onc is a keeper. Happy New Year missus. Get strong and then get over here. What a nice photo of your gang! Wish we would have had a longer visit, but it was sure nice to see everyone for Christmas! HI Joanne, I have been checking your blog to see if you had an updated message. What a nice shot of your kids. I am so glad to hear that you had a nice xmas. I am planning a trip to Regina, but the way it is looking it will probaly be early February. Take care of yourself and I hope that you like your new oncologist. I know how important that relationship is!! I wish you a peaceful 2007. New Year's Greetings to all of your family. I hope the year starts with encouraging scan results and a good rapport with your new doctors. We continue to keep all of you in our thoughts and prayers. Saw some pictures from the Christmas gathering - looks like a great time, as usual. Take care and keep us posted. Love, Nick and Lorraine P.S. Great picture of the Schweitzer "kids" - I'm sure they enjoyed being together over the holidays. So glad you are doing this blog. It's great to hear how it is going. The kids look great. Amazing how fast the time goes. Glad you had a great Christmas. Ours was great too but over too fast. Thinking about you. Loved your cook book! Great spending time with you and your family over the Christmas holidays. 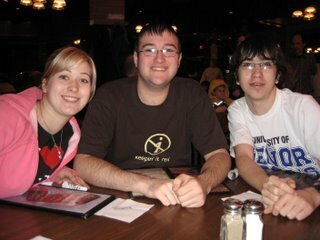 It was especially nice to touch base with Michelle and Craig since they are now young adults and aren't often in Regina. Keep well rested even though it can be exceeding BORING at times.